In 2012, the IwB began a partnership with Dublin City Council (DCC), the municipal authority for the City of Dublin, and the city’s multidisciplinary unit called The Studio. The IwB worked to address Dublin’s service delivery, in particular public engagement and the relationship between the municipal government and citizens. 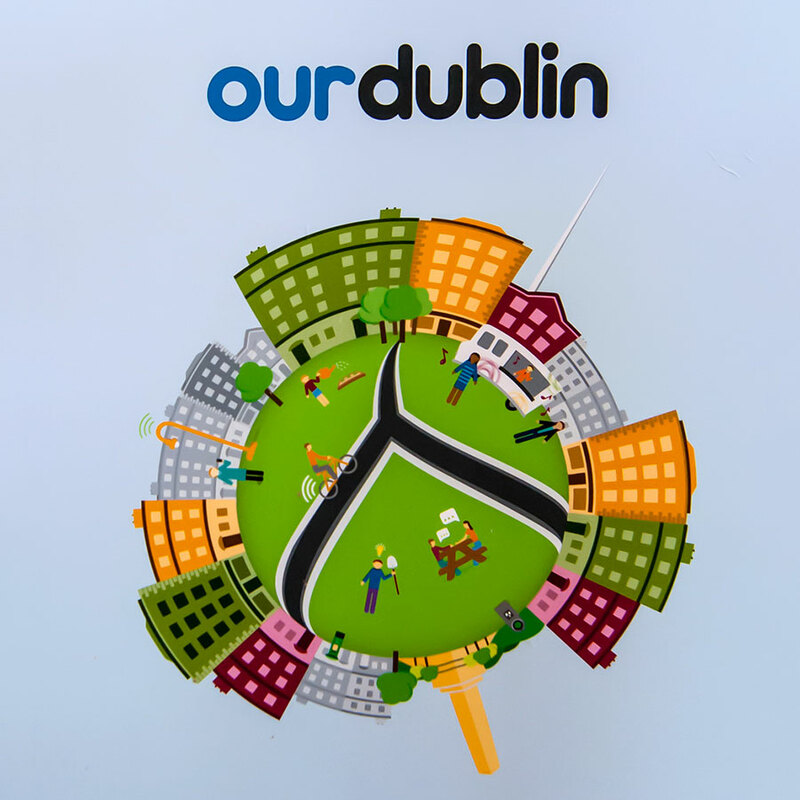 Among several projects, the partnership produced “Our Dublin”, a multi-platform system and a transformational program that reimagines public service delivery for cities now and in the future through the development of digital tools that engage citizens and city staff on mutually selected projects. Our Dublin, a system of programs intended to support and activate civic engagement and collaboration. There is an opportunity in Dublin to revitalize public service delivery and reshape the relationship between the public and the city. The partnership goal was to help Dublin look inward and reimagine existing government practices, while at the same time reaching outward and embracing the creativity of its residents. 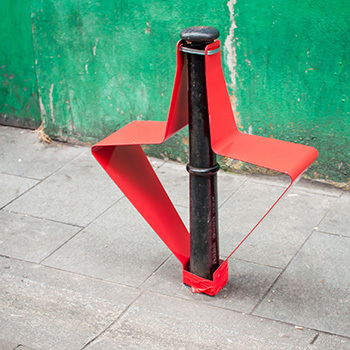 Prototype created by the students for city seating that can clamp onto poles and bollards. 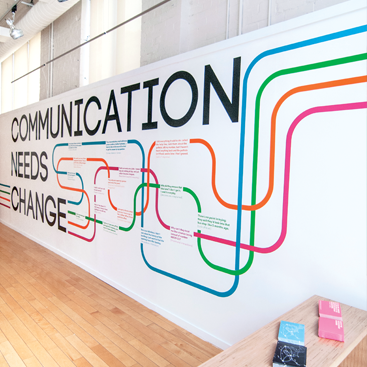 Communication Needs Change, the first term exhibit created by the students. Concept of a personalized dashboard that visualizes and organized city data for residents and the city. Dublin is one of Europe’s oldest cities, but it is small in comparison to most world capitals. It led Ireland’s expansion during the Celtic Tiger economic boom, but it also felt the equal brunt of the economic crisis starting in 2009. Dublin faces a host of challenges like derelict properties, rising crime rates, and a severely decreased budget to deal with these new problems. It is a major world city, with over a million people, that is struggling to provide its municipal services. 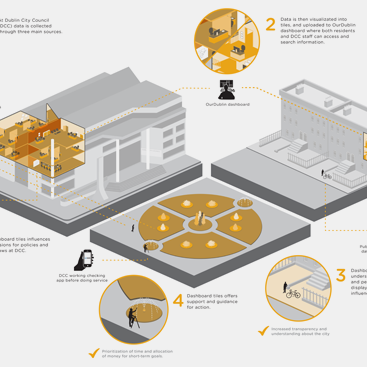 In the fourth year of City Systems Project, the IwB partnered with Dublin City Council (DCC), the municipal authority for the City of Dublin, and the city’s multidisciplinary unit called The Studio. In October and November 2012, the IwB students and staff spent five weeks doing research and working with DCC and The Studio staff in Dublin. Driven by the host of challenges facing Dublin, the IwB students presented small case studies to DCC suggesting cultural projects and agendas to encourage public engagement, urban regeneration projects to create better public spaces, and a range of propositions to create transparency and clearer communication between the city and the public. Ultimately, DCC choose the latter as the focus of the major project. The IwB students proposed Our Dublin, a system of programs intended to support and activate civic engagement and collaboration. Our Dublin responds to DCC’s aims to innovate and create intelligence around the issue of public engagement and to improve trust between the citizens and the municipal government. The project is outlined in the Our Dublin book. It focuses on making better connections with citizens and gathering data about the city. Through sensor software, data mission applications, and an open and accessible digital dashboard DCC is able to collect information about city issues from citizens. Users can analyze, understand, and react to the data through interactive tools. In addition, the program features a Project-Maker Starter Kit, an information and digital resource kit that fosters public imagination and problem solving around city challenges and helps citizens start and collaborate on projects to build their community. While Our Dublin strives to embed interactive tools in city space and in the citizens’ hands, the program’s focus on new technologies such as sensors and digital applications is balanced by on the ground delivery of program components like the DubBus, a rotating bus with regular stop points in Dublin City where citizens can assemble and share ideas onsite with local staff, and participate in community engagement around service planning. The Dublin partnership moved the City Systems research to a bigger level by looking at a complete city system with over a million residents. The exhibition, charrettes, and publications made during the IwB-DCC partnership serve as useful case studies for other cities that must reevaluate their service delivery and relationship with citizens. Our Dublin may become the new face of the DCC, or parts of its vision may be implemented. What is most important however, is that proposals like Our Dublin are being circulated, and are opening up staff and citizens’ minds to facilitate change in service provision. For DCC and The Studio, working with the IwB created more visibility for local projects, stirring organizational synergies and wider debate locally. 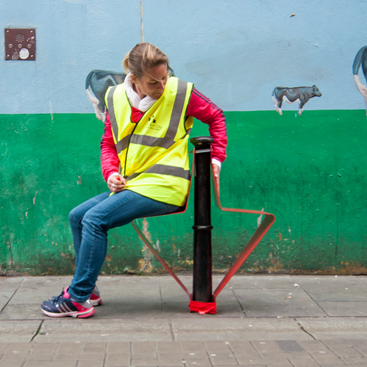 A student public furniture design project that produced a seat concept for Dublin street. The Bollard seat can be attached to existing bollards, which are a common feature of Dublin’s sidewalks and roads. 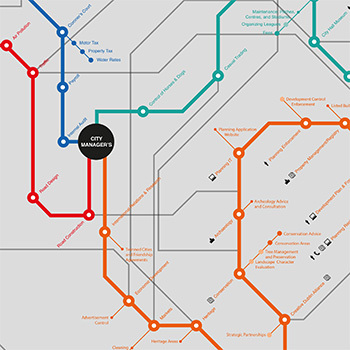 This student project examined 5 departments of Dublin City Council and created a transit-style map showing their functions and international connections. The IwB students, staff and faculty travelled to Dublin and conducted research for 5 weeks in October and November 2012. The research trip culminated in The Dublin Charrette, which brought together the IwB students with Irish students, Dublin City Council employees and local community representatives. Charrette participants examined how public services are delivered within the City of Dublin, and proposed new and improved service designs. Each team was given the task of designing a service model, as well as a way to take it to the streets with an awareness campaign that promotes or informs the new service, helps to improve transparency, and reaches stakeholders who might not be comfortable using digital services or know how to access these services. A small IwB in-house charrette that looked at improving communication in Dublin by strengthening the connection between residents and city council. The IwB students showcased their work on The Dublin Project in an End of Year exhibition at the School of Design gallery, held from in 2013. The exhibit showcased the students’ research, inspiration and outcomes from the whole year’s work and focused on the “Our Dublin” proposal. Also featured was the students prototype of the DubBus. In the summer of 2013, the DubBus travelled to Dublin and was exhibited at City Hall.